Book and pictures courtesy Richard Blacher. Comments by Paul Jackson. This book measures 8 3/4" x 5 7/8" and has 153 pages. The binding is cloth over boards. 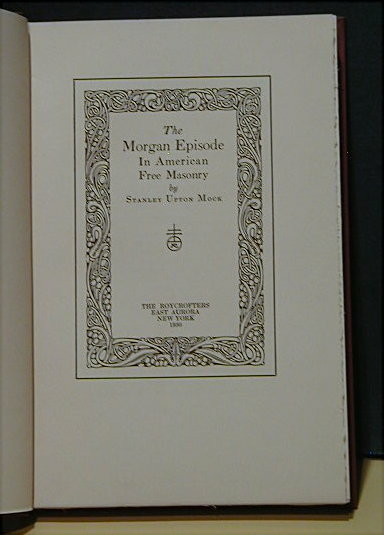 The book deals with Free Masonry and the anti Masonic sentiment that arose in 1826 after the Masons of the Batavia New York Lodge were accused of murdering Capt. 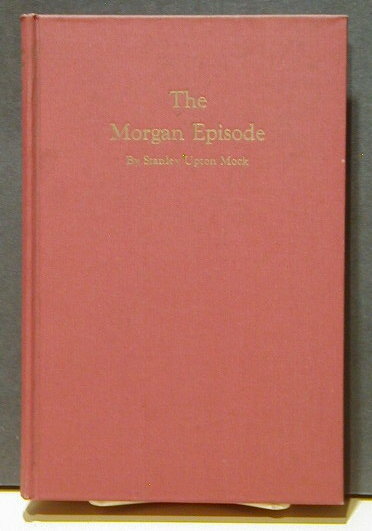 William A. Morgan for divulging secrets of the society. Jeremiah Brown was charged with complicity in the abduction of Morgan, went into hiding, was tried at Lockport and acquitted by Judge William S. Marcy (who went on to serve as governor 1833-1838). This event catalyzed the Anti-Masonic movement led by Thurlow Weed. The mysterious disappearance, in 1826, of William Morgan (c.1776-1826), a Freemason of Batavia, New York, who had become dissatisfied with his Order and had planned to publish its secrets led to a severe anti masonic movement. When Morgan's purpose became known to the Masons, Morgan was subjected to frequent annoyances, and finally in September 1826 he was seized and surreptitiously conveyed to Fort Niagara, whence he disappeared. Though his ultimate fate was never known, it was generally believed at the time that he had been foully dealt with. The event created great excitement, and led many to believe that Masonry and good citizenship were incompatible. Opposition to Masonry was taken up by the churches as a sort of religious crusade, and it also became a local political issue in western New York, where early in 1827 the citizens in many mass meetings resolved to support no Mason for public office. In New York at this time the National Republicans, or " Adams men," were a very feeble organization, and shrewd political leaders at once determined to utilize the strong anti-Masonic feeling in creating a new and vigorous party to oppose the rising Jacksonian Democracy. In this effort they were aided by the fact that Jackson was a high Mason and frequently spoke in praise of the Order. In the elections of 1828 the new party proved unexpectedly strong, and after this year it practically superseded the National Republican party in New York.